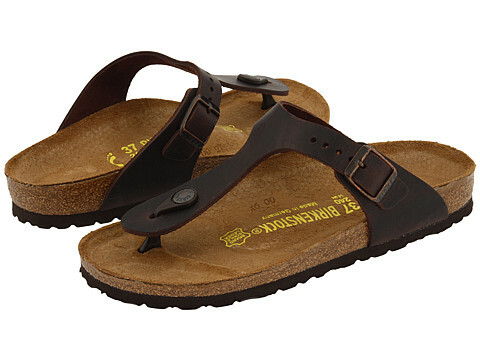 Every two years, I buy a new pair of Birkenstock Gizeh sandals in dark brown. They give me a blister for a week between my toes, but after that short period of pain, they're heaven. They work with shorts and casual skirts. Love, love, love. The New York Times writes about Birkenstocks. New York Magazine isn't too happy about the return of "mandals". If you prefer your shoes really, really old, check out this shoe. The NYT article, like most of the NYT Style section, is stupid and infuriating. I realize that headlines are written by different people than write the articles, but when the headline says “Macho” and the article contains the phrase “the perfect foot gear with a pair of skinny white jeans,” you realize this is something I can ignore. I have three pairs of Birks that I haven’t worn for years, though I never had the Gizeh. Do you buy them because they wear out (I never had that problem with my pairs)? I only quit wearing Birks because I discovered a Dansko clog outlet near my house, found them far more comfortable, and have been in Danskos ever since. I’m buying a pair of fit flops this weekend; they’re supposed to be much better for your feet. I’ll let you know. With a little love (and a new sole) you can get a lot more wear out of a pair of birks. A good birk store can repair the sole and then you don’t have to break in (or buy) a new pair! A little cork sealant occasionally and the shoes will last for years. I think my current pair is coming up on 6 or 7 years on the foot. Birkenstocks must be very comfortable, because they sure are ugly. At 52, comfort is a big deal to me, but not so big a deal that I’d wear Birks. My personal favorites are Born sandals, very comfy, kind of feminine and usually available at DSW for less than $40.00 (with my coupon, of course). Mine look good after two years, have endured a lot of wear, and dry out well after walking the SC coast. I’ve contemplated a pair of Birkenstocks for several years now. Based on your post, I just might be ready to move forward.